All the configuration parameters for Picasa are found on the Picasa Options screen. This screen controls all Picasa behavior on your computer. 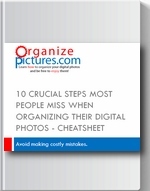 The change you make here will influence your Picasa experience greatly. 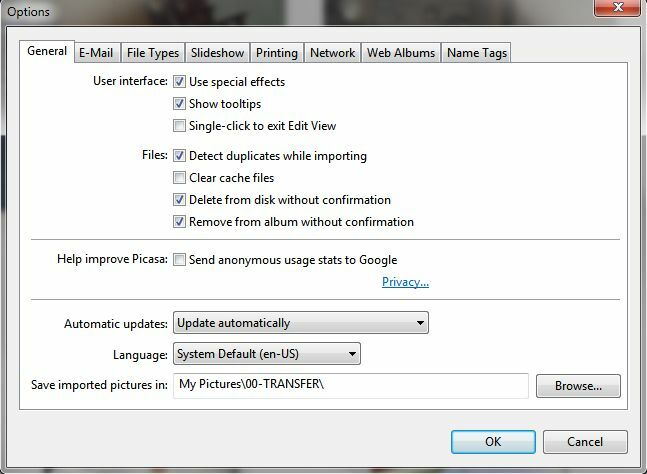 How to get to the Picasa Options screen? Click on Tools menu on to top tool bar and then choose the Options menu item. 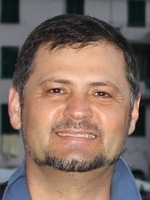 General, E-mail, File Types, Slideshow, Printing, Network, Google+ Photos and Name Tags. The Picasa Options window has several tabs. Let’s take each tab on its own and I’ll explain the best settings for you. These are the only things that I have checked on the General Tab. Everything else is unchecked. User Interface check: Show Tooltips. Save imported pictures in: My Pictures\00-TRANSFER\ (this is the location where your date folder will be created when transferring pictures from your camera). Send movies as: First frame ( I don’t send movies via email. If you do, check the Full Movie instead). I have all the file types checked. This means that Picasa is my default viewer for all these file types. This is fine with me. I don’t have anything checked here. I used to have a music .mp3 file selected to start when I start the slideshow in Picasa, but I turned that off…it was annoying. I have the default settings here because I don’t really print digital pictures from my computer. I use services like Costco or Fotki.com. I have checked Automatically detect network settings. This is the default settings so I don’t think you have to do anything here. I don’t care about Google+ for now so I left the default settings on which is pretty much having only Include with photo uploads checked under Name Tags. I have unchecked everything here because I don’t like using Face Detection since it slows down Picasa quite a bit. If you want to turn Face Detection on check the Enable face detection and also check Store name tags in photo so the names become keywords in the IPTC keywords field. I have Picasa 3 on my laptop. I rarely use it much due to my preference as to having personal photos on a USB/FlashDrive. My problem is that what photos I have on my USB is put into the Configure Picasa Photo Viewer pin window. Although my photos can’t be seen on Picasa unless the USB is connected. But I don’t like having pinned tag names as history. How do I delete pin/pinned photo tags from Configure Picasa Photo Viewer side opening window that displays these’s pins? Besides one at a time. There are to to many to remove from the list. Any other way,faster with one sweap? I’d verymuch appreciate your help. David…I hope I am understanding your question correctly. Once you use a tag for an image in Picasa, regardless where the image is located, that tag becomes part of the tag history. It goes in the Picasa database and it will appear as a used tag. Unless as you said you delete the tag from every image. Picasa Photo Viewer has limited configuration options that do not include anything about displaying tags. Bottom line is that I do not think you can do much.